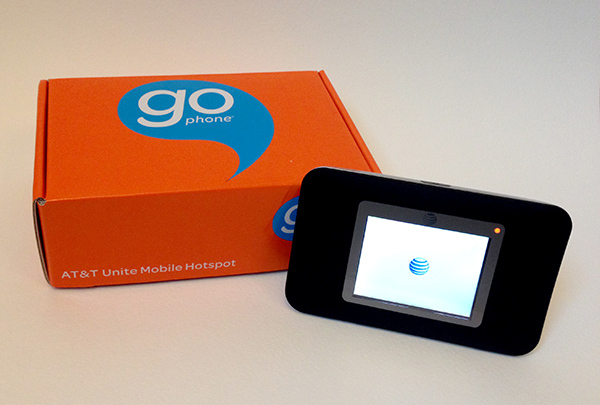 Disclosure: I received the AT&T Unite Mobile Hotspot for GoPhone by NETGEAR at no charge for the purposes of review. All opinions are very much my own. While at the Techlicious and TravelingMom Holiday Tech and Travel Show I was generously gifted an AT&T Unite Mobile Hotspot for GoPhone by NETGEAR. I’ve wanted to do a review for a while now, and I’m so happy to share my thoughts! I wanted to try out the hotspot for myself, so I decided to take a mini day trip with Miss V to Snoqualmie Falls, just east of Seattle. Since I knew we’d be in the car for a bit, this would be the perfect time to test the AT&T Unite out. The AT&T Unite is shorter than my iPhone 5, but just a bit thicker. I slipped it into my purse and we were ready to go! 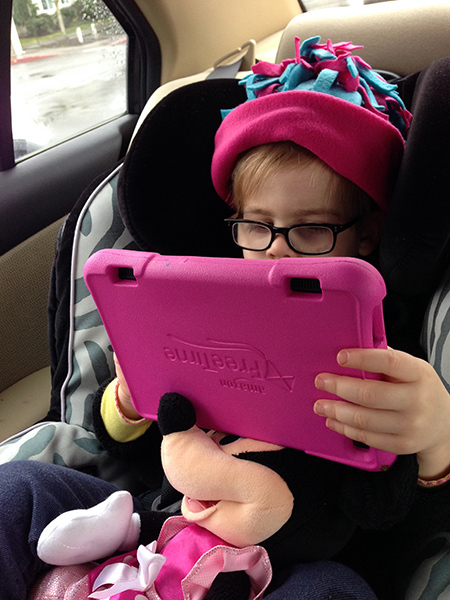 We took along our Kindle Fire HD7 Kids Edition because it’s best used when WiFi is available. All video is streaming, and many apps only work when WiFi is connected. Here’s Miss V totally into it! 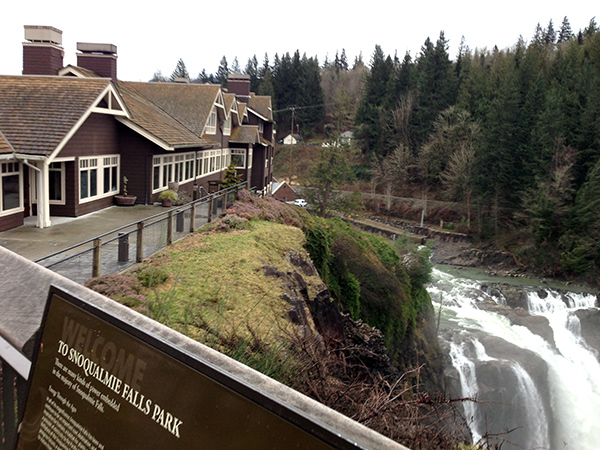 When we got to Snoqualmie Falls, I brought the Kindle with us. 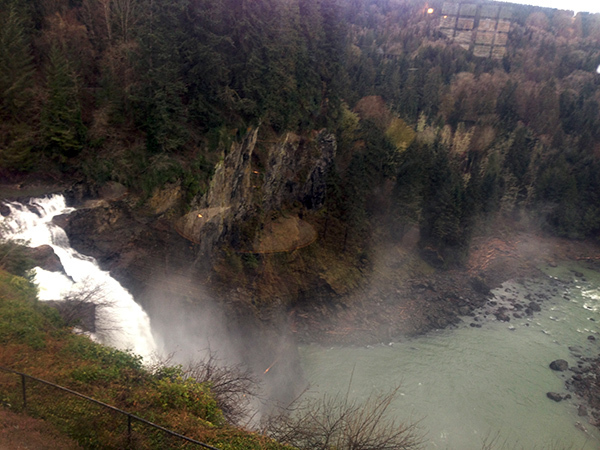 Snoqualmie Falls is really just an amazing place to visit. The park is super nice, the falls are practically next to the parking lot, and the best thing, it’s free. And yes, that is The Great Northern Hotel from the TV show Twin Peaks! Only in real life it’s called The Salish Lodge and Spa. And if you’re wondering, they do serve cherry pie with damn fine coffee! Despite the fact that it was in the 50’s, the wind was absolutely freezing at the top of the falls. It was time to get where we were getting, The Attic at The Salish Lodge. 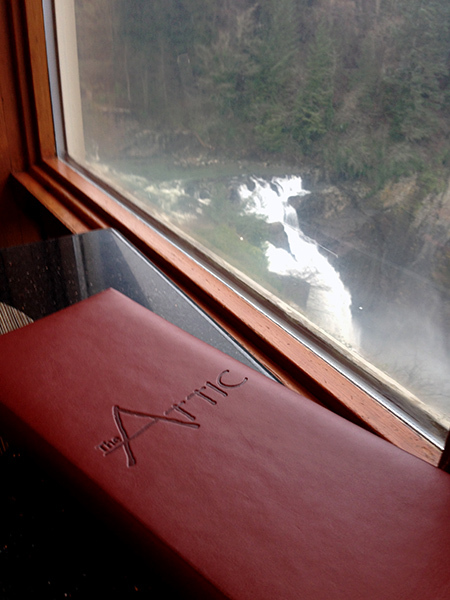 The Attic is the casual restaurant at The Salish Lodge, and serves hand-crafted sandwiches and wood-fired pizza. Just a few tables have an amazing view, and we were beyond lucky to get one of these seats. 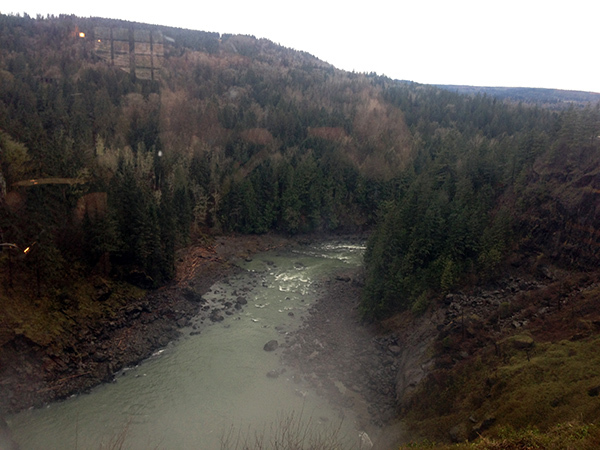 I had not been inside The Salish Lodge before, and I was really impressed! The Kindle made an excellent distraction for Miss V while we waited for our food! Which by the way, the food was excellent. 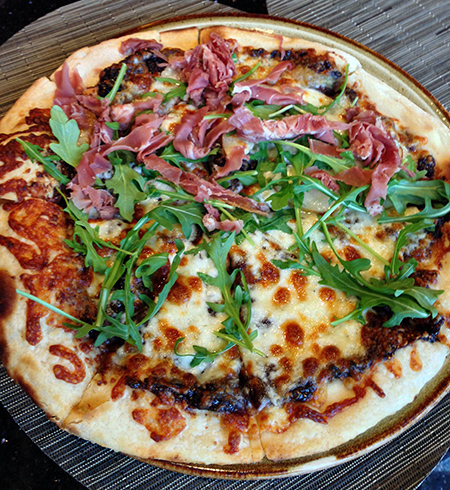 We had a half cheese half Washington pear and prosciutto pizza. After our delicious meal we headed out, as it was really just too cold to do more exploring. Having the hotspot available made everything easier. I wasn’t going to worry about Miss V getting fussy during the drive, and entertainment at the table was great. 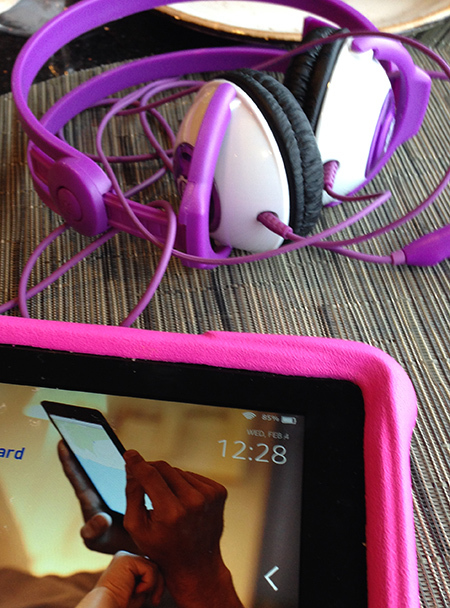 The AT&T Unite mobile hotspot is ideal for family road trips, entertainment in airport terminals, hotels, you name it. Even everyday running around town, when you know the kiddos are bored. Hey, they could be doing homework! 🙂 Back when I was working conventions, this hotspot would have been invaluable. WiFi through convention hosts costs ridiculous amounts of money. So much so that my company often chose not to use the internet at all on the convention floor. The AT&T Unite would have solved those problems, and multiple salespeople would have been able to use their laptops to connect to the backend program, avoiding handwriting mistakes and extra time. 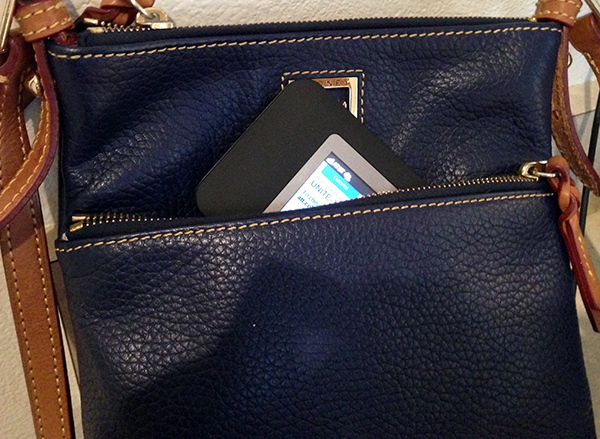 Unlike hotspots created by cell phones you don’t have to plug in the AT&T Unite to avoid quickly draining the battery. Honestly, I never use public WiFi because I don’t want to take chances with getting my device hacked. The AT&T Unite creates a secure hotspot. I also really like that I don’t have to purchase a contract, and can just buy a GoPhone card at the supermarket when I need it. So, I will certainly be keeping the AT&T Unite hotspot and taking it on our next vacation! It will definitely save time and hair pulling-out! Big huge thanks to AT&T and NETGEAR!